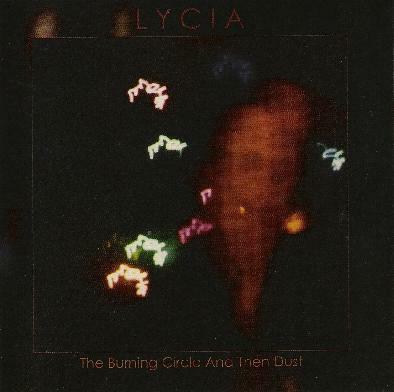 Lycia - "The Burning Circle and then Dust"
Originally released in 1995 as a 2-CD set on the Projeckt Records label, The Burning Circle and then Dust is the second in the Silber Records Lycia reissue series. According to the promo sheet, truncating the set down to a single disc for the reissue was the decision of Lycia honcho Mike VanPortfleet, who did the remastering. Cocteau Twins seem to be a common analogy in Lycia reviews, though I'm admittedly clueless about that band. Darkwave/Goth is the general category you could stick Lycia in if you wanted to pigeonhole them, though I think they've got a lot more happening in their music than most of what I've heard from that genre. Several of the songs struck me as being like Goth renditions of The Legendary Pink Dots. The opening tracks, "A Presence in the Woods" and "Wandering Soul", set the tone for the album with their symphonic backdrop augmented by light acoustic guitar and percussion, along with VanPortfleet's eerie vocals. The music is intense and foreboding, but at the same time dreamy and atmospheric and includes simple but very pleasant melodies. Other highlights in this 18 track set include "The Return of Nothing", which has a seductive melody and beautiful floating vibe built around a kind of drugged carnival like theme. I love the guitar licks on "On the Horizon", where simplicity reigns but the brushstrokes are oh so masterful. "Silence and Distance" is one of my favorite tracks, being a deep space instrumental with cosmic symphonics and effects. "Slip Away" is another favorite and best exemplifies the full Lycia wall of symphonic sound that wraps itself so fully around you. Listening with headphones the music just filled my entire head and I could feel it all the way down to my feet. "Resigned" is another excellent track, being more sparse and subtle than most of the album, but has one of the most purely spacey and angelic sounds of the set. Very nice. The promo sheet notes that this album was the first collaboration between VanPortfleet and Tara Vanflower & David Galas. I had actually forgotten about Vanflower until near the end of the album when her vocals appeared on "Nimble". I don't hear any of the synth-pop elements I described in my review of Lycia's Empty Spaces album (see AI #26). The Burning Circle and then Dust is much more like the spacey, dreamy symphonics of Estrella (see AI #31), which are far more to my liking. A beautiful album. For more information you can the Lycia web site at: http://www.lyciummusic.com.